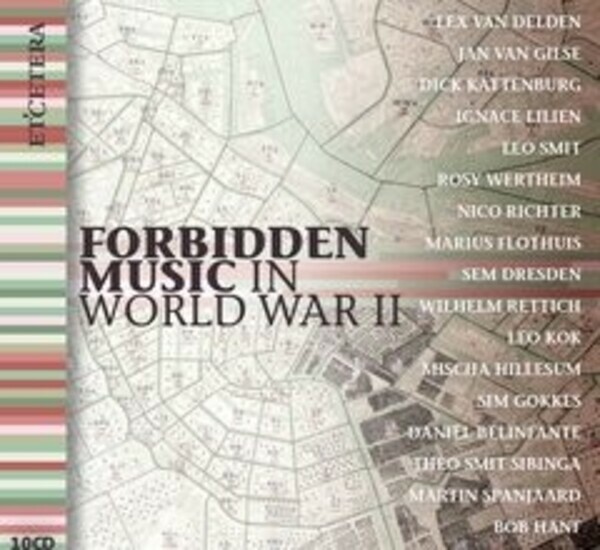 This CD box set, released seventy years after World War II ended, contains music composed by those who were persecuted during that same war and any performance of these works was strictly forbidden at the time. Nineteen Dutch composers were deported to concentration camps, of which only six survived the atrocities. Others went into hiding or they survived using fake identities. Almost all saw their musical career end inopportunely. The untimely loss of these composers dealt a severe blow to Dutch music history and as a result the musical landscape was completely altered. This box set is, therefore, designed to revalidate the generation of composers that was lost in the war. The Leo Smit Foundation has done research on these maltreated, forgotten composers and their works. Artistic manager Eleonore Pameijer assisted Etcetera in assembling the set from a collection of previously released recordings on a range of other labels. CD no.10, however, contains a number of surprises and premi�res.